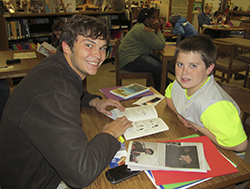 In partnership with the Sycamore Readers from Indiana State University (ISU), the VCPL LifeLong Learning Center is a reading coaching site for elementary school-aged children. Struggling readers in grades K -5 are pre-tested for their reading level and matched to an ISU student who has been trained in a literature-based coaching program. 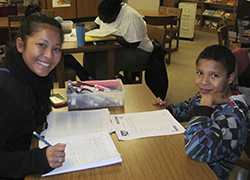 Reading Coaches and children are matched one-to-one, for two 30 – 45 minute sessions each week. Post-testing is conducted to assess gains in reading levels. Registration forms are available in the LifeLong Learning Center or click here to register online. The program begins approximately 3 weeks after each ISU semester begins and ends prior to ISU’s final exam week. Call the LifeLong Learning Center at 812.232.1117 for more information. The Sycamore Readers ISU office number is 812.237.2967.